3. How important is the text for you? My sense is that the tactility and materials are the most important, but perhaps that depends on the book? Often you seem to destroy or obliterate the text as in Clutter of Love is a Dream Carved on the Head of a Pin and Thoughts in the Form of a Letter. Although the basis for my work, whether artist book or installation, is conceptual, much of my artwork stems from an essential materiality. The artwork reflects on both my material sensibility as much as the content and issues that comprise their core. Paper has been my preferred material for 30 years and I have explored its potential as a non-neutral substrate in my image making, book making and process. That said, much of my work since 2001 focuses on interlinearity, the concept that considers what is communicated between the lines, the subtext, the portion of knowledge and the world that we ignore or omit, or consider negative space. So text is essential - even if by its limitation. But the essence of all my work is that the materiality should reiterate/reinforce the content just as all aspects of the artist book should support its ideas. as a result, I work hard to make the materials support these ideas. - Spun in to Gold: First 100 Words - Using the traditional Japanese technique of "shifu," where kozo paper is made and then spun into thread to be used for weaving cloth, I altered a sound poem consisting of my daughter's first 100+ words and transformed them into the golden strands of a fairy tale. Here no one (except parents/ grandparents) are interested in what are the exact words. But their potential as the advent of language and of communication is formidable. In destroying the sound poem (cutting and spinning in to threads) I enact a process of creating or re-creating the act of word process and transform it to something more. ...into gold strands (honoring the fairy tale where the name of something/someone is thesecret and savior) and also to a series of strands with dots still on them: isn't reading looking at a white ground with a rectangular shape of a dot matrix that we look at that our brains translate into ideas? Cannot the reader of this book look at the dots on the strands and create his/her own 'reading'? - In Solomon’s Wisdom: A Fable, A Poem A Eulogy A Dream Ten Nests and Eight Holes, a eulogy to my mother is printed, then ripped apart and stapled back together again. In doing so, each of the 8 pages leaves a gaping hole. This physical manifestation of the act of creating is simultaneously, an homage to motherhood, a declaration of the limitation of language to sum up a life, as it is a nod to the wisdom that the sum of parts can never equal the whole. The book works with three additional texts, which complement the eulogy: A synopsis of the Judgment of Solomon fable, where the king resolves a fight between two mothers by proposing to rip the child in two; excerpts from the poem, “The Word” by Pablo Neruda, where he defines the birth of life as the birth of the word; a text fragment based on a dream, where my mother leaves me on a bus and dances away, along with a set of rendered and cut photographs of birds nests. All texts & images presented are fragmented and incomplete. Finally, the paper that I made for this edition: the eulogy is on paper pulp painted to feel like clots of earth & graphite / the other texts & nests are on a very thin translucent sheet: When the substrate is translucent, the possibilities of exploration concerning ‘that which is not said’ is all the more fascinating, and the layering that occurs creates even greater richness to the meaning. 2. You have certain themes you work with again and again, like motherhood, feminism, memory loss, the Kabbalah. Do you have a collection of stories, poems, texts and ideas that you keep up and draw from? Not really. I write very regularly - it is part of my art practice. And it often seems that my writing enters my artwork or at least informs it. I would say though, that at particular times specific texts obsess me and become essential for the work that I am figuring out then. For example, when I read about the Black & White torahs I realized that this issue of interlinearity has been central to many thinkers throughout the ages. Or, my daughter once gave me a small drawing with the text: .."gloves that make you fly...". These words hang near my work table and I cannot even begin to tell you how many works have come out of this lovely phrase..
As for those 'big' themes you mention, they are just components of my life my reality. I am a woman, an artist, a mother, a feminist,... As I age, I experience memory changes, I have watched my mother die of Creutsfeldt Jakab disease - where her brain was destroyed - But long before that happened, I was making work about memory and'logos' and the brain's functions. We draw on our lives -- but good art transforms the personal into the universal. 4. How and when do you decide whether a book will be an edition or a unique artists book? Some of your unique books like Black Torah and White Torah, or Meditations in Form I, II and III seem like they might be something one would edition, perhaps, to show in several places. Other than my first letterpress book, "Am I Here", 1985 (which I never really editioned), all my early work were unique pieces (starting in 1982). 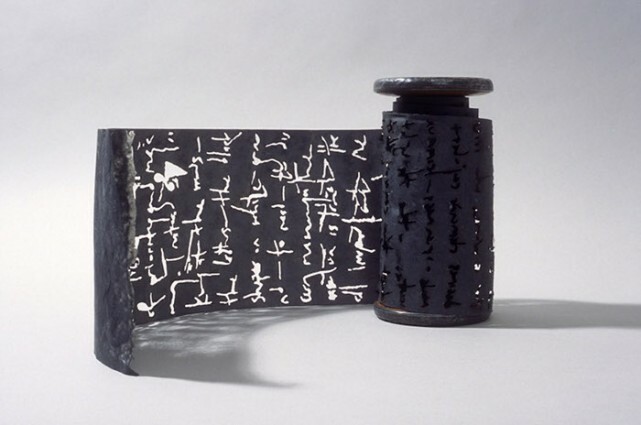 I guess since I didn't know much about the book arts field (I was working in Vienna, Austria 1981-84 pretty much in isolation) and my training was in sculpture (degree in art history & sculpture at Princeton) - my focus was on examining the book as an art object - a unique one. It wasn't until 1991 that changed, when I was approached by my now husband, sculptor, Andras Borocz, who asked to collaborate - and he was insistent that the artist book we make was in at least an edition of 8 ('one for me, one for you, one for exhibition, one for showing around, and the other 4 to sell to cover costs'). That artist book, "Lipton: The Gallows Book" was a huge time investment and although editioning was in some ways terrible -- since it entailed lots of paper-making, lots of hand drawing adn collage etc. it made sense (financially). But I must say, I have little commitment to editioning, in the traditional sense- in other words I feel that certain portions or decisions must be truly the same & reproduced exactly - but I very often change details allow my self to explore variations- in the portions of the book wherevisual elements & information are not essential to the concept of the entire work. That actually started back with the Lipton book where Andras frequently changed the drawn details from book to book. It has been a great liberation - and allows me to make small varying editions rather than be a slave to copying. Still since my artist books are extremely labor intensive (since I do all the parts from concept to paper to artwork to binding) ... are tiny - usually 5/10/15 or 20. If I could accept just doing one or two each year then I could edition etc. But I want to produce more. And in truth, I often do not complete editions. it seems totally acceptable - to have fewer than originally committed to -- the fewer copies are then just more valuable. I have one edition of 50 (made only 30 of them) & one of 42 (made only 35 of them), one of 30 all are made)... and then the smaller ones. How I make the decision? Well, it is hard as I would rather only make one or two of everything. Sometimes it's just about the task at hand. It varies. It seems that my more recent books (the past 7 years) I've forced myself to edition, and I did so less when I had less of a market to do so. I also make more codices than I used to - and perhaps that structure and its historical referent compels me to view the artist book as a multiple. Black Torah, 2003, graphite, flax paper with text burnt out, 132" x 6"
Black Torah - the text was fully burnt out -- arduously with a wood burning tool. Not only would I not want to do that again, I got a terrible eye infection in the process (the paper is pigmented with graphite and I think that its fumes killed my eyes). But, technically it could be you are right. The MEditation series are all drawings in pulp, watermark and mixed media. Certainly the series could have continued -- editioning? Doubtful. White Torah - graphite drawn/written texts that were erased and rewritten enumerable times. Editionable? Possible. No interest at the time. Or better said: I had too many other projects of interest to resist.